Joy Huntley is aged 93 and from a sheep-farming family on Quadra Island, where her father was a contemporary of Chief Bill Assu and taught English and house-building to the native residents. Joy worked at Summerland’s Experimental Station breeding apples, and later on was House Mother in Duncan at St. Margaret’s, the same boarding school she commuted to by train as a child. Joy comes from a family of history buffs, and was very keen to share her stories. 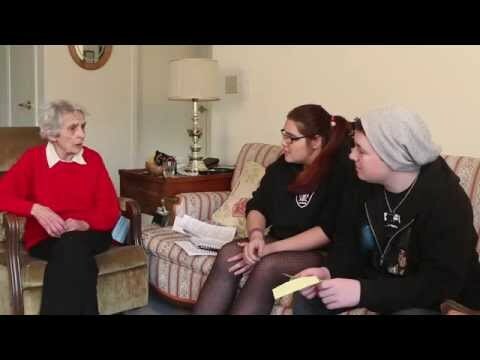 The interview was conducted by students Terran and Hailee on Feb. 21st, 2014, in Joy’s home in Kiwanis Village in Courtenay. Could you tell us your name? My name is Josephine Huntley, but my mother called me Joy and I’ve been Joy all my life. Thanks, Joy, for agreeing to let us interview you. Feel free to share anything you like, or not share if you don’t want to. My very first memory as a child was when I was five years old, they took me to Victoria to have my tonsils out and I remember the great big brick building that we stayed in. We stayed overnight. They put me in a room with a bunch of other children. I suppose the operation was in the morning. I’d never been with so many children my own age before, and they kept ringing the buzzers and annoying the nurses. It was quite a party. I remember that so clearly. Where were you born, exactly? Campbell River Hospital. My mother waited three weeks for me. I was due the end of March and there’s always a bad storm in March. My father always studied the weather so he arranged for her to stay with somebody in Campbell River. And of course I wasn’t born until April 3, so I told them I was supposed to be an April fool but I fooled them, that’s my little joke. I think my first sister was born in Victoria, because my mother had a sister down there. Where did you live after that? So we went to Vancouver, just for the war, and Phyllis and I were both going to UBC so she bought a house up near the university and we took the bus in to college. My war effort was I wrote to six boyfriends and they wrote back to me. They were very happy to have somebody to write to. One was my girlfriend’s brother and the others were just acquaintances. When we went to UBC it was compulsory that all the girls had to take First Aid, learn how to make a bed, and those sort of things. And the boys all had to drill, march up and down. So we did our war effort that way, but a lot of them quit and went to the war. I lost a lot of friends. We both graduated and Ursula went to Byng high school. The minute the war was over they went back to the farm. But by that time I’d graduated and got my job in Summerland so I went into the Interior. My husband was what he called an “apple knocker”. His father had a fruit orchard. We stayed there until 1950 and then all the peach trees sold. We had a fruit cannery and there weren’t going to be any peaches so we came back to the coast. That’s our life history. Better read the book, Whistle Up The Inlet. They must have had 20 boats. They travelled the whole coast. We did very well – we got a boat twice a week. Campbell River got one almost every day because they were right on the channel, you know. Then there were CPR boats and CNR boats that did the same things, but the Unions did all the little places. We did have a boat came into Heriot Bay, I think the Cardena or one those other Unions, they were Union boats too. So we had boats at both sides of the island. Oh yes, they did wonderful work. But there were no roads. I know, I remember my dad when he got a car and wanted to go to Victoria, we were driving along this Vancouver Island road and an American car came around the corner. He had to run into a stump just to miss this car coming round the corner. There was no passing lane. Everybody went by train. I think my most fun then was travelling on the train! We loved that. They didn’t have a roundhouse out here. About here, where we are now, they had a big loop on the railway track and the train just went around till it got itself turned. Most places they had a roundhouse where they used to put it on a wheel and turn the motor around, but that was what they did here. We had a parlour car which we got to sit in, with nice cushioned chairs like that, and then there was the second class, which was straw seats that folded up and down. Then they had a baggage car and a mail car and the mailman sorted the mail as we were travelling. We’d stop at a town, and he’d put the mail bag on a hook for certain towns. They got really good mail service in my day! What is your favourite memory of travelling on a train? The fact that we had the Pullman cars that you could take and set up. We didn’t have the benches, and we pulled them up to a table and played cards. It was never busy, especially when we left Courtenay in the mornings there were very few customers and it had lots of room, so we had a ball. We took our own food. Then we went to Parksville, single track, and three trains met in Parksville, three tracks. One went to Port Alberni. One went to Courtenay and the other one was heading down island to Victoria. So that’s how they got away with only one track. It was very well run. The three tracks are still there. They were talking about that train today – I was beginning to give up hope. It’s all been okayed. The money’s all there and everything but somebody won’t say we can do it. It’s just so frustrating. Somebody’s pulling strings. It’s a shame. Tourists loved it. They were just beginning to build a tourist business when they closed it down, but you look at those ties. They’re all rotten. It’s got to be re-done. They say they’ve got the money but I don’t know. I keep my fingers crossed. How was school when you were younger? I went to the Heriot Bay School which was a mile, so we walked, and I think there were 17 students at the maximum. The big problem was that when the boys got to be teenagers, 14 or 15, they all went to work on the fish boats or the logging camps and so sometimes there wasn’t anybody in grade 8 unless there were a couple of girls. We loved school. We had fun. We had a flag pole and we went out and hung the flag up every morning. They don’t do that in schools any more. The flags just wear out up there. I liked school. We had one teacher that got busy and showed us how to have a little garden out in front and plant things. Of course we didn’t have plumbing of any kind. We had a creek nearby where the boys had to go and fill the water bucket every morning so we had water to drink. And we had biffies out the back. They grew hops over them. That was supposed to stop the smell!